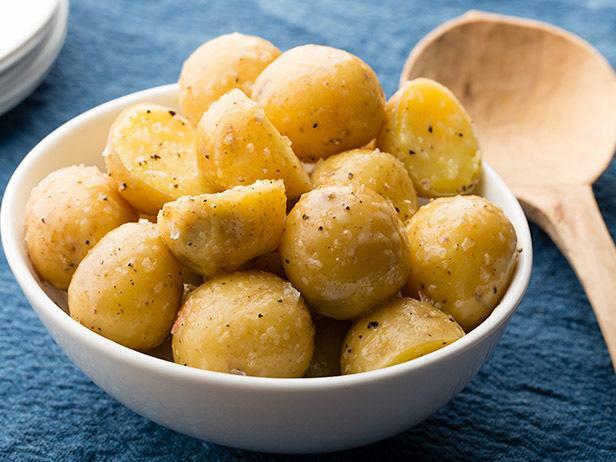 The garlic, bay leaf, and peppercorns really bring out the natural flavor to these spuds. Put the potatoes, garlic, bay leaf, and peppercorns in a large saucepan, add cold water to cover by about an inch and season generously with salt,. Bring to a boil, lower the heat, and simmer until potatoes are fork tender, about 5 to 8 minutes depending on their size. Drain and discard the garlic, bay leaves, and peppercorns. Halve the potatoes, if large, toss with the butter and season with salt, and pepper, to taste. Keep warm.